Why Are Renewable Sources of Energy Better than Nonrenewable Sources? Being one of the people who want to protect the environment makes you think why are renewable sources of energy better than nonrenewable sources. After the Industrial Revolution, fossil fuels became our primary source of energy, fueling many companies, power plants, and industries. That was the period when the advancement of technology measured a massive boost, and everything people owned required a form of energy to function. Nevertheless, the thirst for development and money might have driven us too far that we forgot fossil fuels represent a nonrenewable source of energy. They are very useful indeed, but our planet holds limited resources of fossil fuels. Most likely, when we would have explored all of them, we would be forced to use renewable sources of energy. Therefore, wind power, solar power, and hydropower will become more popular than we think now. Previous studies indicate that we can power our whole planet with energy if we use offshore wind farms. Renewable energy is infinite energy, sources that never end, offering us the chance to use them continuously. Nevertheless, providing energy through renewable sources for entire cities can be pretty expensive. This is a great downturn for industries and companies who try to implement environmentally friendly solutions. The most popular nonrenewable energy sources we use nowadays are fossil fuels, namely oil, gas, and coal. Most of the energy in the United States is provided by non-renewable sources like uranium, propane and fossil fuels. Uranium is a toxic chemical which is difficult to be stored. On the other hand, the burning processes of propane and fossil fuels trigger air pollution, affecting the environment. The massive amount of carbon dioxide from the atmosphere causes ozone layer depletion. Hence, the effects of climate change appear. The use of nonrenewable sources of energy leads to dangerous global warming effects that damage the whole planet. This is how human-made climate change occurred, disrupting numerous ecosystems and affecting hundreds of thousands of habitats and species all over the world. Furthermore, climate change also triggers sea level rise due to the meltdown of glaciers in the Arctic. An increase in sea levels can cause catastrophic floods, affecting thousands of people living on the seashore. What is more, when burning coal, it emits sulfur dioxide. This chemical is responsible for causing acid rain that can destroy numerous crops and thus impair agriculture production. Acid rain also pollutes natural sources of water, damaging species of plants and animals living in them. Over time, this can also trigger buildings to decay. Renewable sources of energy can help us annihilate the effects of climate change. However, scientists believe that the most dangerous effect of using fossil fuels is the emission of greenhouse gases. These dangerous chemicals in the atmosphere trap the heat coming from the sun, triggering global average temperatures to grow. The increase in temperature disrupts many natural phenomena, affecting a massive number of species of plants and animals. Due to this tremendous heat, they find it difficult to adapt, and some of them reach to be on the verge of extinction. Innocent species of plants and animals suffer because of human-made climate change. Another climate change effect consists of heat waves. This year, the latest heat wave transformed the planet into a living hell, where temperatures boosted more than scientists have predicted. The heat wave from the summer of 2017 did not only affect animals and plant, but also humans. The high temperatures made it even difficult for us to adapt and the high humidity in the air was suffocating. Environmentalists and policymakers still try to come up with different solutions to diminish the amount of greenhouse gas emissions to annihilate global warming. Furthermore, they still hope that we will be able to reach the Paris Agreement goal to diminish the global average temperatures by 1.5 degrees Celsius. Renewable sources of energy are eco-friendly, they do not pollute the atmosphere, and we can use them continuously because they are unlimited. The most useful renewable sources of energy are wind power, solar power, and hydropower. However, when using these sources of energy, we can also face some inconveniences. For instance, it is difficult to gain control over them, and some of them can be expensive to use. Furthermore, when it comes to solar energy, the entire process of electricity production depends on the light coming from the sun. Therefore, solar power depends on the weather, just like wind power. If the area where you install solar panels or wind turbines is not sunny or windy, then you will not be able to use them. Another disadvantage is that it is hard to produce massive amounts of energy to meet the planet’s energy demands. Solar power relies on the radiation coming from the sun that is captured in solar panels. The solar panels are exposed to sunlight, and the sunlight turns into electrical energy to either fuel appliances in the house or heats it. 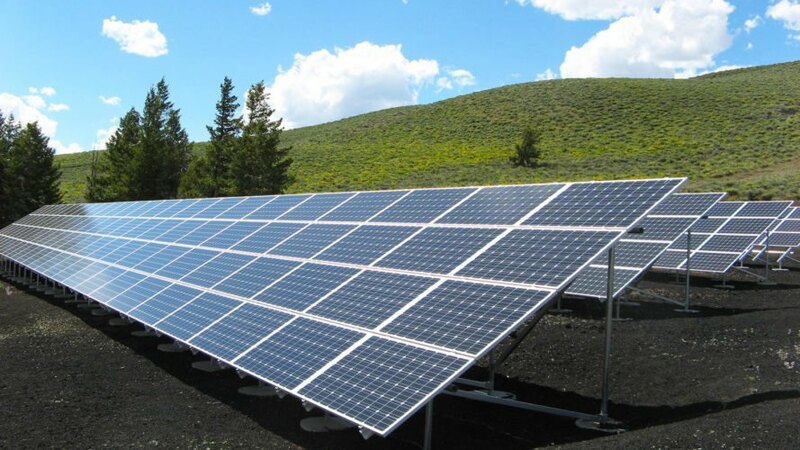 One of the problems here is that solar panels occupy a lot of space and gathering solar energy it strictly depends on the weather. Hydropower is the type of renewable energy that works via the movement of the water. It may also be called hydroelectric power since experts use water to make turbines turn and create electricity. Nevertheless, hydropower can cause changes in the environment, affecting plants and animals. Wind power represents energy captured due to the movement of the wind. Windmills are the most common form of wind power. A windmill uses the energy of the wind to grind grains. Nowadays, wind turbines are even more popular. The wind turns its blades, spinning a turbine that produces electricity. However, there is a disadvantage regarding the noisy blades of the turbines when they operate. It is advisable to use more renewable sources of energy than nonrenewable ones because it implies less pollution. In this way, we reach to protect the environment more and save up fossil fuels that represented a limited source. Renewable sources of energy are environmentally friendly, and they can help us decrease the levels of greenhouse gas emissions. Hence, the effects of climate change could fade away.